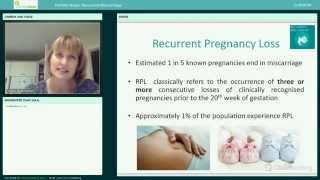 Dr Karen Buckingham presented a Webinar on Recurrent Miscarriage on Thursday 14 May 2015. Dr Buckingham practices medicine at Repromed, and is also involved with the Auckland Recurrent Pregnancy Loss Clinic. She give a 20 minute presentation on Recurrent Miscarriage, which was followed by a question and answer session. The recorded webinar highlights are now available here to watch on video. Miscarriage is defined as a pregnancy that ends spontaneously before 20 weeks gestation. In NZ it is estimated that one in five known pregnancies end in miscarriage. These rates may be even higher as many miscarriages go unrecognised because they occur before a woman even knows she is pregnant. The majority of miscarriages occur in the first trimester. Once eight or nine weeks are reached and the baby’s heartbeat is seen on a scan there is only 4-5% chance of a miscarriage. The risk then continues to drop as the pregnancy proceeds. Most pregnancy losses are sporadic, non-consecutive spontaneous miscarriages that occur as an isolated event. Recurrent pregnancy loss (RPL) classically refers to the occurrence of three or more consecutive losses of clinically recognised pregnancies prior to the 20th week of gestation. By this definition, approximately 1% of couples will experience recurrent early pregnancy losses. This is greater than expected by chance alone suggesting that in at least some of these couples, a specific cause can be found. Recurrent Miscarriage has many emotional implications. Dr Karen Buckingham presented a Webinar on Recurrent Miscarriage on Thursday 14 May 2015. Dr Buckingham practices medicine at Repromed, and is also involved with the Auckland Recurrent Pregnancy Loss Clinic.